Marco Island : Development/Marina C-4 Land with over 2,000 ft. of Bellingham concrete floating docks, 1.92 Acres 84150 square feet of upland with 10,420 Conservation Easement with mangroves. 1.68 Acres or 73,046 square feet of Submerge Land State Lease. 58 slips w/1428' of dock space. 580 ft. of shore line with 277' of concrete seawall and ramp and another 303' of Rip Rap. Plans available for a 52 unit complex over 120,000 square foot 9 story building, approved with the city. Adjacent parcel is included in the 1.92 acres. Parcel id # is 5, .52 Acres or 22,500 Square feet. Taxes on this parcel are approximately $675.00 per year. Marco Island City water and Sewer. Great opportunity in SW FL. Property is located at the Goodland Bridge, on the Marco, NW side. 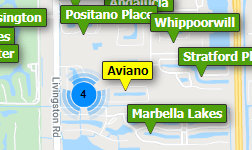 Marco Island : All current tenants hand picked by the owner with over 30 years in the leasing business. Every tenant has current liability insurance; the landlord named as additional insured. Camera system with nine hardwired cameras hooked up to brand new computer/DVR system. Marco Island : Located in the midst of Marco Island's "industrial" center. WIth C-5 zoning, the space is flexible for a variety of "light industrial" services. Easy access for employees and customers alike with parking a few steps from the front entry. Marco Island : I.325 - End unit completely built out as 4 offices, reception area and bath or open up for your own customization. Lots of light with windows around the side. Located on San Marco road with good visibility. Marco Island : I.324 - Commercial condo currently completely finished as office space with reception area, very large private office that could easily be subdivided into 3 offices, small kitchen and bath. Access to the unit from the front or rear of the property. Current tenant on a month to month lease. Need professional assistance selling your property at Marco Island? Find out how an Area Specialist can help to generate more property exposure in order to get the most money for your investment in the least amount of time.